I can hardly believe that this toy comes from the same line as the DC Collectibles Arkham Knight figure. Nightwing is 10x the toy that the Knight is. Double elbows, double knees, wrist and ankle articulation, head tilt and swivel and an ab/chest roller. 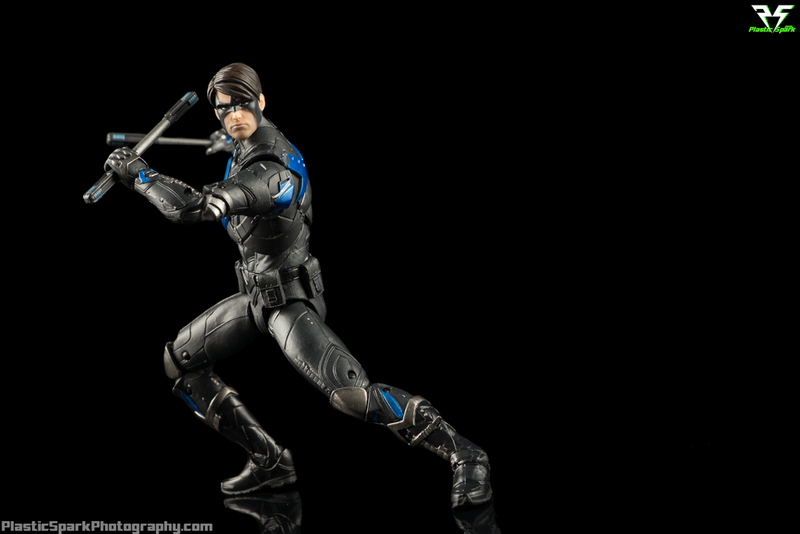 Nightwing has almost everything I want in a modern action figure and at a sub $20 price point to boot! The face sculpt is well done but the final paint finish could use some work. The 5 o'clock shadow looks like mud and his eyes are looking in two different directions. I'm eventually going to just white out the eyes similar to the more traditional Nightwing mask. Solves the eye problem and it'll make him look awesome! 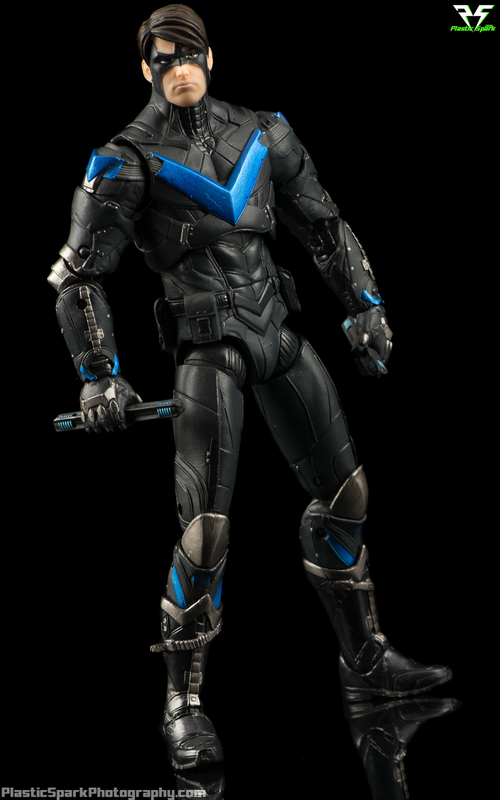 I absolutely love all the sculpted details and the realistic take on the Nightwing suit crossed with modern style ballistic armor looks great. Nightwing looks like he popped right out of the Arkham games and onto my desk. Unlike the Arkham Knight he can actually pull off some convincing combat poses and a little bit of acrobatics too! The included Escrema sticks look great and come in both extended and collapsed forms. It would have been nice if he had slots on his back to hold the collapsed sticks but for the price point I can't expect too much. Check out the full gallery below and leave me your thoughts, questions, or requests in the comment section at the bottom! Check out Plastic Spark on Facebook!